The Trump administration today withheld $65 million of a $125 million payment from the UN agency that is supposed to provide aid to Palestinian refugees but has instead been repeatedly found to use it to help the PLO and Hamas in terrorist acts. The State Department said it was releasing the rest of the installment — $60 million — to prevent the agency from running out of cash by the end of the month and closing down. The U.S. is UNWRA’s largest donor, supplying nearly 30 percent of its budget. The agency focuses on providing health care, education and social services to Palestinians in the West Bank, Gaza Strip, Jordan, Syria and Lebanon. Not surprisingly, the PLO is reacting like a five year old, throwing a tantrum, as if it deserves this money no matter what it does. 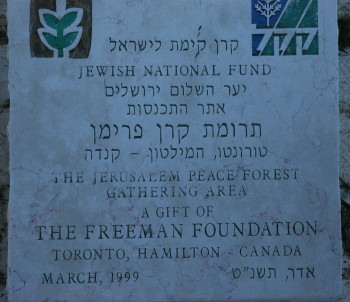 Just after the 1967 war, a strip of land in Jerusalem that had been part of no man’s land after the city was divided following the 1948 war was turned into a Peace Forest to symbolize “the hope for peace and serenity between all Jerusalem’s residents.” Located on a hillside that overlooks the city, the Jewish National Fund sponsored a campaign to have the site landscaped elegantly, with a promenade and a series of architectural observation points, each designed differently as if their architects were competing with each other for the most creative structure. In 2003 my oldest nephew was married from the highest point on this hillside, just above the Peace Forest, with the entire city of Jerusalem as the backdrop. At the time there was a catering hall at this location, and it seemed to them to be a perfect place to tie the knot. It is often claimed by those who oppose Israel that it is an apartheid state that imprisons its Arab population, both in Israel itself as well as in the West Bank and Gaza. Like much that is said about Israel, however, this claim has little to do with reality, and in fact, as I said yesterday, turns reality on its head. Inside Israel, Arabs have the option (though some have decided not to take it) of becoming full citizens. Thus, not only are Israeli Arabs among the most prosperous Arabs in the Middle East, they have more rights under the Israeli democratic government than most Arabs in every other Arab country. They can vote, and have even served as elected members of Parliament. Compare that with the way Arabs treat their religious minorities. Jews are of course forbidden. Christians meanwhile are fleeing the Islamic Middle East because of its persecution of non-Muslims.